Children of families who regularly eat dinner together are less likely to engage in risky behaviors. As a family, you can share healthy eating ideas and parents can act as role models at the table. If you're used to sitting in front of the television either together or separately, unaccustomed to eating meals as a family, etc., then start slow. Start by setting 1 day aside each week and make that day family dinner night. If someone in the family works late or can't make it to family dinner, make breakfast your family mealtime. Turn off the TV and focus on each other and your food. 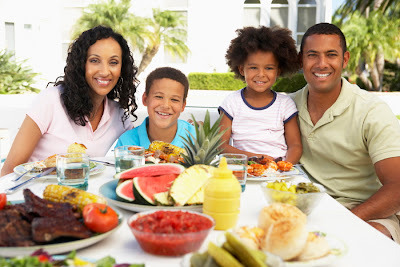 Increase your nights until your family regularly eats dinner together. Not sure how to strike a conversation? Afraid you'll sit together in silence? What did you learn in school/work today? How was work (clients, employees, etc.)? The weather is supposed to be ______ this weekend, what are our plans? If you knew you were going to be stranded on a desert island, what 3 things would you bring? Do you learn more when you win or when you lose? Does our family seem too busy? Should we change anything? What is your most valued possession and why?